Having recently moved somewhere with a cable internet service that is not completely reliable (is it anywhere? ), we were looking for a backup solution. A lot of mobile hotspots require a contract and monthly plan, which was going to work out expensive. So I ended up going with a device from Walmart. For $79.88 I picked up the TruConnect Internet on the Go Mobile Hotspot. In the stores there's no mention of "TruConnect" on the packaging, but that's the company that Walmart has partnered with. You can buy this same device from TruConnect.com directly, but the service plan is priced differently. With TruConnect you pay a small monthly fee, and then a per MB fee. It's still a very compelling value when compared with other contract or pay as you go mobile hotspots. But I didn't really want to pay a monthly fee - even the small one that TruConnect charges - for something I would only use occasionally. By buying it through WalMart there is no activation or monthly fee. Instead you just refill it with data whenever you want. When you refill, you have the choice of paying for data for 30 days, or for data that doesn't expire. For example, for $25 you can get 3GB for 30 days, or 1.5GB that doesn't expire. The latter plan is called "Go Big", while the former is "Go Bigger". For me, "Go Big" is ideal. I can load it up with data, turn the device off, and it doesn't expire. Next time our cable service goes out, I just power it on, and away I go. Setting up was simple. Once I cut it out of the bubble pack, I installed the rechargeable battery that is included, and then charged it up. The device itself is the same thickness and width as my iPhone 4S, and about an inch smaller, so very portable. I left it charging for a couple of hours, and then connected to it using the ssid and password printed on the sticker on the back of the device. There's a simple guide which walks you through the steps to activate the device. At first I couldn't connect to the internet to reach the activation page. The troubleshooting guide suggested turning the device off and back on, and sure enough that worked like a charm. It has one button - to power on/off - and two lights. One on the button showing whether it is on, charging, battery low, etc. And the other on the side showing whether it is connected to the internet. The guide has a very clear list of what all the states of the two lights mean, which is great. Not counting the couple of hours charging the battery, I had it out of the box, activated and was browsing the web with it in about 10 minutes. 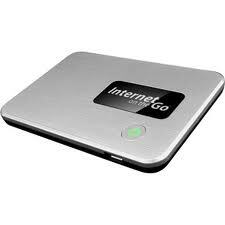 For someone that wants a backup to their home internet service, or for an inexpensive data plan to check email while on the road, I highly recommend Walmart's Internet on the Go Mobile Hotspot. Update 2015 - A few changes to the Internet On-the-Go service make it a lot less appealing. They have dropped the "Go Bigger" plans. The "Go Big" plans are now called "Forever Data Plans", which ironically, are no longer "forever". This morning I received my first email from Internet On-the-Go advising me that my data has expired. Apparently if I don't use at least 1 MB every 60-days, then my data expires. And to top it off, you get less data for the same price. So instead of getting 1.5 GB for $25 (or 3 GB with the old "Go Bigger" plans) you now only get 1 GB. For me the whole benefit of the device was being able to charge it up, turn it off, and only use it if our cable service goes out. The new changes mean the device no longer meets my requirements.